On 1 March 2008, Lisa Tylee set off on the challenge of a lifetime when she left Houston, Texas, to embark on a 9,000-mile cycling tour round the USA to raise money for Venezuelan street and shantytown children. If all goes to plan she should be arriving back in Houston in October. "Cycle Challenge USA 2008 / Bici Sin Rodilla" is a huge physical ordeal for anybody to attempt, but for Lisa it will be especially gruelling as she will be doing it with just one foot pushing the pedals of her specially-adapted bike, because she was born without a knee in her left leg. It's already been challenging. Lisa celebrated her 40th birthday on 4 March after cycling in driving rain and a night in a grotty motel. But as Jane Blake, a trustee of the charity says, it can only get better. Her circular route will pass through 24 US states and Washington D.C. and will take Lisa through freezing mountain ranges and hot deserts as she pedals "from sea to shining sea." It will be a far cry from the conditions in her native Caversham, a small, sleepy town on the banks of the Thames River in Berkshire. But it won't be the first time Lisa has endured a gruelling physical adventure to raise money for charity. 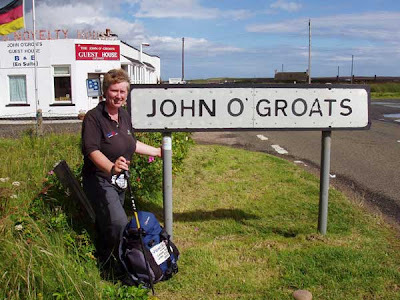 In 2005, she walked the length of the United Kingdom, from Lands End in England to John O'Groats in Scotland. The 1,300 mile walk took her 4 months to complete and raised over 10,000 pounds. Lisa, a co-founder of the charity Veninos (Venezuelan Children In Need), is undertaking her latest challenge to raise money for community education projects in Venezuela and as a way to increase awareness of Veninos' work to improve the life of urban street and shantytown children. In 2000 she was honoured for her charity work in Venezuela by Queen Elizabeth II, who awarded her with an MBE (Member of the British Empire). 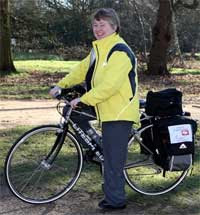 Lisa will be cycling an average of 50 miles a day during "Cycle Challenge USA 2008 / Bici Sin Rodilla" and will spend at least 171 days on her bike. The journey will take her to: Houston - Miami - Washington DC - Baltimore - Philadelphia - New York City - Pittsburgh - Cleveland - (Cincinnati) - Chicago - Denver - Salt Lake City - San Francisco - Los Angeles - San Diego - Las Vegas - Oklahoma City - (Tulsa) - Dallas - Austin - Houston. Events will take place en route and Lisa is hoping to be able to speak to the local press, schools, corporate and community groups in all of the places she stops. Veninos is a non-political, non-religious UK-based charity that is also registered as a not-for-profit, tax-exempt organisation in the USA. Lisa can be sponsored by visiting: http://www.firstgiving.com/cycleusa2008 in the USA or www.justgiving.com/veninos in the UK. Well done Lisa. You are doing a great job. How can the children of Venezuela get a proper education or a house to live in without Veninos? If it wasn't for you the streets of the cities would probably be overrun with poor street children. They should give you a medal.